BBC 1. 4 episodes: 27 January-17 February 1973. Starring Jon Pertwee as ‘Doctor Who’ and Katy Manning as Jo Grant. I’m now up to number eight in my selection of the top ten classic Doctor Who stories and I’m running out of space with so many excellent episodes remaining. It would be inconceivable not to include a story by Robert Holmes, who for many fans was the best writer of the classic period of Doctor Who. Holmes ‘got’ Doctor Who in a way that few others did: perhaps only Terrance Dicks was as influential during the classic series. I’m not sure that I could nominate any of Dicks’s scripts for my top ten: ‘Horror of Fang Rock’ might be an outside contender and I also rather like ‘The Five Doctors’ despite the limitations of the twentieth-anniversary special which had to cram in as much Doctor Who history as possible. That’s not the case with Holmes: indeed one could make a reasonable case for a top ten comprised mostly – possibly even entirely – of Robert Holmes stories. Admittedly ‘The Krotons’ is no classic – its Brummie-accented egg-box monsters are among one of the most risible alien menaces in the series’ history – but the underlying concept demonstrated that Holmes was looking to vary the formula of Doctor Who. And in any event he wasn’t responsible for its visualisation. However, ‘The Ark in Space’, ‘The Talons of Weng-Chiang’ and ‘The Caves of Androzani’ all have convincing top-ten credentials – all three serials regularly feature in fan polls of favourite Doctor Who stories – while ‘Spearhead from Space’, ‘Terror of the Autons’ and ‘The Time Warrior’ are all pretty good for the Second Division. Even the lesser Holmes stories such as ‘The Ribos Operation’ and ‘The Power of Kroll’ are above-average Doctor Who stories. Indeed perhaps his only real dud was ‘The Two Doctors’ and that seems to have been more John Nathan-Turner’s pet project to do another multiple-Doctor story. It would be interesting to see what Holmes’s ending for ‘The Trial of a Time Lord’ would have been like: the Doctor and the Valyard locked in a fight to the death inside the Matrix? Sadly Holmes died before the serial was completed and the wrap-up of that ill-conceived season was left to Pip and Jane Baker. I’ve opted for ‘Carnival of Monsters’ for my Robert Holmes selection because it’s always struck me as being something of an underrated story. This is the one where the TARDIS materialises on a passenger-carrying cargo ship somewhere in the Indian Ocean in the 1920s where the passengers and crew seem to be caught in some kind of time loop. Then at the end of Episode 1, a giant hand reaches into the ship’s hold and picks up the TARDIS. It turns out that the ship is in fact an exhibit in something called a miniscope – a sort of peep-show that contains miniaturised specimens of different races. The problem is that the miniscope’s owner, a travelling showman called Vorg, does not know how to operate the machine properly (miniscopes are illegal). And when a race of fearsome monsters known as Drashigs escape from their compartment, mayhem naturally ensues. Like most of Holmes’s Doctor Who scripts, ‘Carnival of Monsters’ is a complex and multi-layered story that works on several levels. On one level it’s a comedy about a travelling showman: I particularly like Leslie Dwyer’s performance as Vorg (Dwyer is perhaps best known as the Punch and Judy man who can’t stand children in Hi-de-Hi) and Cheryl Hall as his (not-so) ‘dumb blonde’ assistant Shirna. On another level the story can be seen as a commentary on the nature of entertainment. “Our purpose is to amuse, simply to amuse – nothing serious, nothing political,” believes Vorg. The Doctor, however, is morally outraged by the ‘shameful business’ of collecting intelligent species who live in an artificial environment unaware that they have become exhibits in a peepshow. We don’t have to look far to see this as a reference to the treatment of animals in zoos and circuses. And on yet another level it can be seen as a self-reflexive commentary on Doctor Who itself. When Vorg asserts that the fierce Drashigs are “great favourites with the children”, we are reminded of the argument made by the Doctor Who production team whenever the series was attacked for being too frightening: i.e. that children were fascinated by the monsters. Holmes’s scripts often work as satires: ‘The Sun Makers’, for example, is a satire of the tax regime in Britain in the late 1970s. 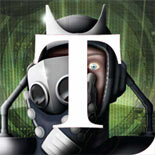 ‘Carnival of Monsters’ can be read as a satire of bureaucracy and petty officialdom. Vorg and Shirna have arrived on the planet Inter Minor which has only recently emerged from self-imposed isolation and still operates a strict immigration policy. Inter Minor is inhabited by humourless petty officials who say things like “amusement is prohibited – it is pointless”. The ambitious Commissioner Kalik is plotting a coup d’état against the government: by releasing the Drashigs from the miniscope (they grow to their full size once outside its force field) and blaming the ensuing chaos on the lifting of the immigration ban. We might just about see this as a commentary on the wider social context of early 1970s Britain. Immigration has often been a political hot potato, and was especially so following the Commonwealth Immigration Acts of 1968 and 1971 which had restricted the rights of Commonwealth citizens to settle in Britain. Indeed 1970s Doctor Who seems to be full of similar allegories. 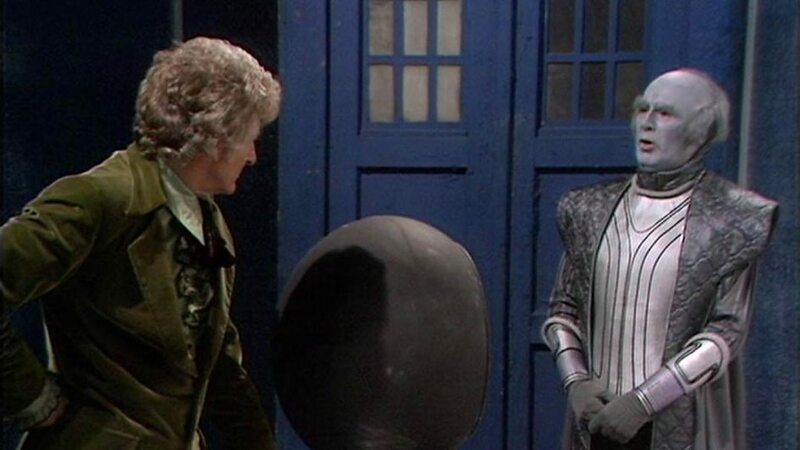 ‘The Curse of Peladon’ – in which a small planet is applying for membership of the Galactic Federation in the face of hostility both internally and externally – has been understood as an allegory of Britain’s entry into the European Economic Community (or Common Market). The Doctor is cast in the role of Prime Minister Edward Heath in negotiating entry with the reactionary High Priest Hepesh as the Enoch Powell figure. ‘The Monster of Peladon’ was an allegory of the miners’ strikes of the early 1970s with the miners of Peladon resisting the introduction of new technologies and working methods imposed on them by the Federation. The miners’ leader Gebek is the ‘moderate’ Joe Gormley figure (Gormley was President of the National Union of Mineworkers in the 1970s) who favours negotiation between the miners and their rulers, while the more radical and confrontational Ettis is clearly meant to be Arthur Scargill, the Marxist militant who succeeded Gormley as president. 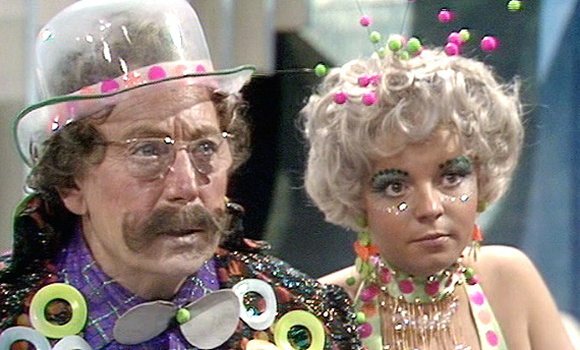 ‘Carnival of Monsters’ exemplifies the more mature direction in which Barry Letts and Terrance Dicks wanted to take Doctor Who in the 1970s: while the monsters are there for the kids, the satirical elements work for older viewers. Dicks was always insistent that Doctor Who was not a children’s series and the BBC’s Audience Research Department found that half the viewers for the series were over fifteen. ‘Carnival of Monsters’ also rebuts the criticism sometimes made of the Letts/Dicks/Pertwee era that all the stories were Earthbound UNIT/alien invasion narratives. In fact there’s as much innovation and variation in this period as any era of Doctor Who. As well as ‘Carnival of Monsters’, Series 10 also brought us a tenth-anniversary celebration (‘The Three Doctors’), a narrative of conflict resolution in the guise of a space opera (‘Frontier in Space’), a favourite monster (‘Planet of the Daleks’) and a piece of undisguised Green Party propaganda (‘The Green Death’). A few trivia notes about ‘Carnival of Monsters’. Ian Marter, who plays the ship’s first officer Lt. Andrews, was cast as Harry Sullivan in Series 12, while Michael Wisher, who plays Kalik, was the first (and best) Davros in ‘Genesis of the Daleks’. 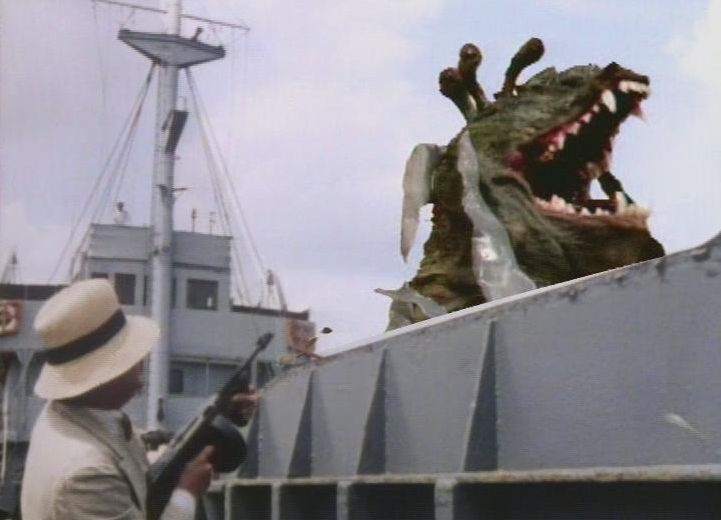 And the Drashigs are some of the best realised monsters in the series’ history – comparable to those in films such as Warlords of Atlantis (1979). The Drashigs were puppets and were realised well enough to persuade Letts to attempt the ambitious ‘Invasion of the Dinosaurs’ in the next season – albeit with perhaps less impressive results! This entry was posted on December 12, 2014 by Who Watching in Classic Doctor Who and tagged Barry Letts, Carnival of Monsters, Jon Pertwee, Katy Manning, Robert Holmes, Top Ten.